Things continue to go pretty well here. 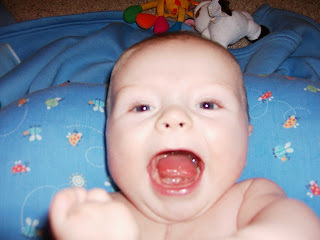 Braden is really cutting some teeth now, he has been so cranky the last two days. Nothing a little shot of whiskey can't cure! Braden has acquired a new nickname this week, "Ironlips." He clamps his little lips down so tight when he doesn't want to take his medicine. There is no way you can get the syringe in there then. It all started after going on the Captipril, it must be nasty tasting. He also scrunches up his face too, he looks like a little old man. 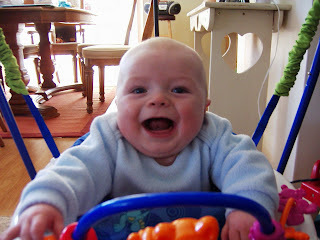 He is also turning into a jumping machine in his Jumparoo. He gets to jumping and squealing like a little pig. He loves it and makes a lot of noise, so then I turn the TV up to hear it and he likes that, thus he starts making more noise. Braden also had a big exciting outing Friday night to the Regional Finals in North Boone. He wasn't a big fan of the horn. He would make a sour face and squawk every time it went off. Braden, Mom, and Uncle Nick then had to drive home in a blizzard. So it was a pretty adventurous trip and a late night for the little guy. Now that hoops is over we should be getting out and about more. Well we decided to post today, so we could report on our cardiologist visit and echo. Dr. Cava was very pleased with Braden’s heart function and his O2 saturation (89%). He does have a small tricuspid valve leak, but that is very common after the Glen. Braden was Mr. Crabs after the echo due to the effects of the sedation they use during the echo. After he was back to his "usual" state, he was able to show off his grabbing and chewing abilities - he had half of Dr. Cava’s tie in his mouth before the doc realized it. We discussed Braden’s future and the “latest and greatest” research that’s out there for these single ventricle kiddos. There’s still so much uncertainty with where Braden’s heart will take him 10-20 years from now, but we’re very hopeful that medical advancements will give him the longevity to live forever – okay, maybe not forever :-) We have a few med changes. We were on a single ventricle study drug since the Norwood. It was Enalypril vs Placebo. The study is to see if a blood pressure med like Enalypril will have positive, lasting effects on single ventricle kids (Some complicated remodeling physiology stuff...). 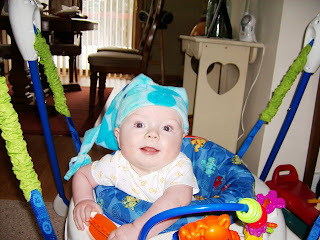 Although Braden was doing well with the study, Dr. Cava felt more comfortable knowing he was actually on a bp med. We are now on Captopril. We go back for another visit in April. 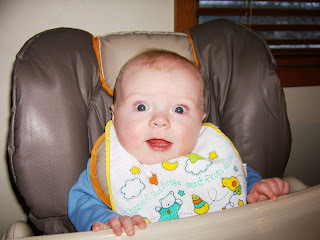 Having a 2 month reprieve was nice, and we were actually excited for the trip to CHW today - as weird as that may sound! Braden is currently 17 lbs. 2 ozs and 27 inches long. He is where he should be on the growth chart, and he seems to amaze our pediatrician every time she sees him. Since the news article and announcement of our charity we have received a lot of positive feedback. Our social worker at CHW told us that there is definitely a great need for something like this at the hospital. We are very excited about the possibilities of helping those in need, because we know what it is like in the first overwhelming days at the hospital. Without all of your support, guidance, and encouragement, this charity would not be possible. Again, family and friends, we thank you! 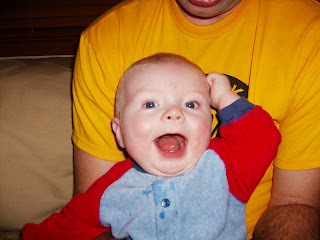 Below, you can click on a link to find a montage of Braden's first 6 months. Warning: there are many pics of him when he was in the hospital. Good evening! As you can see, we found room for yet another contraption for Braden to play with. Even though he'd rather chew on his toes these days, the Jumparoo will be fun when he figures out how to "rock" the house in it :-) We just started putting him in his high chair, and it didn't take long for him to figure out what comes next..."bring on the food!!" This Wednesday is a very special day for our family. Not only is it Valentine's Day, but it's Congenital Heart Defect Awareness Day. In honor of Braden, Rich and I will be sporting t-shirts (compliments of designer and printer, Cousin Carla and Uncle Steve) that say, "My heart beats for Braden." If you can, wear red to help us support all of the kiddos who were born with a unique heart like Braden. This Wednesday we also hope to post the website of our non-profit charity, Heart of Gold, Inc. Stay tuned on Wednesday for the big announcement! One more Wednesday announcement: Braden goes to see his pediatrician. He will get his 6 month well check along with his 4 month vaccinations. 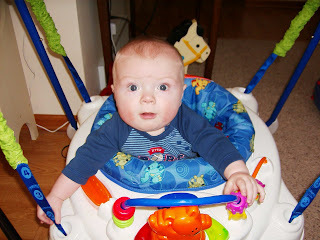 We are anxious to see how Braden "sizes" up to other kiddos his age with weight, height, milestones, etc. Next Monday we're off to CHW for an appointment with Dr. Cava. Braden will have an echo done to see how his heart is functioning post-Glen. 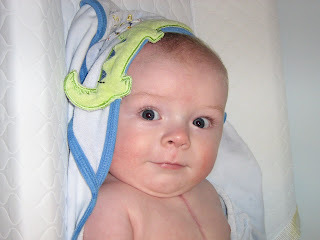 Tomorrow our little buddy Carter will go in for another operation. We're praying that this will "fix" the arrhythmia he's been having now for almost a year. Please keep this sweet little boy in your prayers as well as his mom and dad. Good Evening! Here are our top 4 pics of the week. We think Braden was a little ticked at the gramma-razzi last weekend after Auntie Marci made him pose with her latest knitting project. 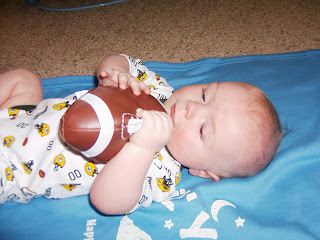 Then, we have Braden practicing for next year's football season. He's hoping to help out Favre next year when the "Pack is back!" 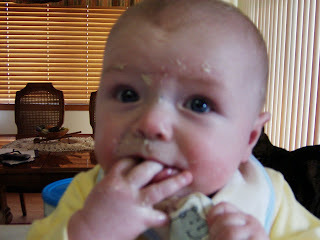 The next pic was this morning's attempt at perfecting the cereal feeding. This was the result of mom not holding away the hands - two fists in the mouth followed by a massive eye rub. The last pic is too cute for words....fresh off of his bath. Check out that nicely healed scar! It's official! We're heading up to the U.P. at the end of March. Braden will be baptized at Eden Lutheran on Sunday, March 25th. We will then have the luxury of hanging out with G'ma and G'pa LaCombe for a few days during our spring break. We also wanted to give you an update on our lil' heart buddies, Sam and Carter. Sam's heart cath. procedure went very well on Thursday, and he is at home now celebrating with mom and dad. Braden was trying really hard today to "blow rasberries" like his buddy Sam. Unfortunately, Braden doesn't have the best timing with new tricks as he blew carrots all over mom :-) We don't, however, have the same news to report from Carter's family. All was going well at home after his release last week, and then he was readmitted just this morning. Please keep Carter and his mom & dad (Erika and Casey) in your prayers this week. Thanks! PS...sorry our layouts seem so funky...they post differently than what we see in the draft box.